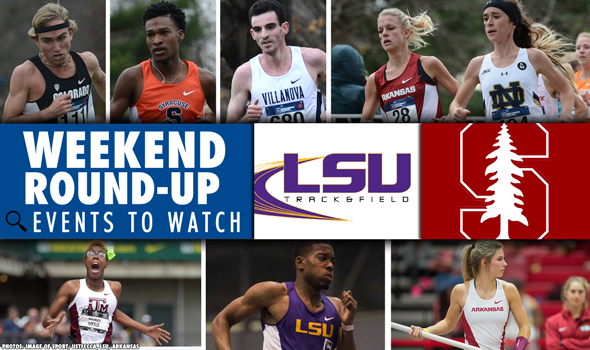 NEW ORLEANS — There are few weekends bigger in outdoor collegiate track & field than the one that is quickly approaching. The last weekend in April, which often bleeds into the first days of May, is a treat. Athletes, coaches and fans can sink their teeth into a cornucopia of big-time meets that shape the national landscape for the rest of the season. If you’re looking for what’s going to happen in Des Moines, Iowa or Philadelphia, Pennsylvania this weekend, we have you covered. Be sure to read up on our preview of the Drake Relays as well as the ever-classic Penn Relays. The following preview will get you ready for the big individual and team title races that are going down in Palo Alto, California and Baton Rouge, Louisiana. In case you don’t know, those are home to the Payton Jordan Invitational and LSU Invitational. Let’s get to it. All events are listed by chronological order in order of when they’ll be contested. Sunday is not a day of rest for the elite mid-distance and distance runners across the nation. The who’s who of collegiate track & field will be at the Payton Jordan Invitational. The top-2 returning finishers from NCAAs last year — Courtney Frerichs (2nd) and Erin Teschuk (5th) — will go head to head in what promises to be an exciting race. Frerichs, then at Missouri-Kansas City, now at New Mexico, finished a two-second runner-up to Florida State’s Colleen Quigley. Teschuk, from North Dakota State, set a career best of 9:02.40 in that race last June. Joining Frerichs and Teschuk will be Colorado’s Erin Clark and Oklahoma State’s Ingeborg Loevnes, both of whom were All-Americans during the fall in cross country. Seven of the 10 fastest men in the steeplechase this season will duke it out as day turns to night in California. Florida State’s Zac Seddon (1st, 8:33.09), Michigan’s Mason Ferlic (2nd, 8:33.95), Northern Arizona’s Caleb Hoover (3rd, 8:37.51), New Mexico’s Elmar Engholm (4th, 8:40.03), Colorado’s Connor Winter (8th, 8:42.44), Louisville’s Edwin Kibichiy (9th, 8:43.76) and UMKC’s Bryce Miller (10th, 8:43.81) are all entered. While all of those men have big-race experience, Seddon and Ferlic are the only two who ran last year at NCAAs. Seddon finished eighth, while Ferlic tripped over the water barrier and brought up the rear. Two of the top returners from NCAAs last year and several of the fastest at this distance this year are scheduled to compete in prime time on Sunday. Stanford’s Elise Cranny, who finished 10th in Eugene, Oregon last year and Arkansas’ Nikki Hiltz, who finished 11th as a member of Oregon’s team will be joined by NC State’s Megan Moye, Michigan’s Shannon Osika and New Mexico’s Sophie Connor, among others. Moye has the fourth fastest time this season at 4:15.05, while Osika owns the 14th (4:16.76). Connor and Moye both made the finals of the mile at NCAAs this past March and finished fifth and seventh, respectively. Also entered in the event are 2014 Bowerman Award winner Laura Roesler and Abbey D’Agostino, who won multiple NCAA titles while at Dartmouth. Blake Haney and Izaic Yorks. Since you twisted our arm, we will. Oregon’s Haney and Washington’s Yorks headline a star-studded field in the 1500 this weekend at the Payton Jordan Invitational. Haney and Yorks ran two of the fastest miles this past indoor season, with Yorks clocking one of the fastest all-time regardless of conditions. Here are a few other names to keep an eye on Sunday night: Adams State’s Oliver Aitchinson, Oklahoma’s Jacob Burcham, Colorado’s John Dressel, Oregon’s Jeramy Elkaim, Oklahoma State’s Cerake Geberkidane, Oregon’s Matthew Maton and Oregon’s Sam Prakel. There are also three professionals ready to add to the excitement: German Fernandez, Evan Jager and Lopez Lomong. Two of the five fastest women at 5000 meters this season are scheduled to compete in this race — Boston College’s Liz Westphal and Georgetown’s Katarina Coogan. Westphal is currently third with a time of 15:44.28, while Coogan is a distant fifth at 15:50.51. Coogan and Westphal will duke it out with Stanford’s Elise Cranny and Vanessa Fraser, Oregon’s Molly Grabill, NC State’s Erika Kemp, William & Mary’s Regan Rome as well as New Mexico’s Calli Thackery. Professionals like Kate Avery, Abbey D’Agostino and Emily Sisson, who all starred at the collegiate level, will be in action as well. There is no sense in laying out the merits of each collegiate competitor entered in the 5000 this weekend at the Payton Jordan Invitational. We don’t have enough bandwidth and you don’t have enough time in the day to read them. We’ll just list them instead. Ready? Sunday’s penultimate event has all the makings of a heavyweight prize fight. In the blue corner, you have Notre Dame’s Molly Seidel. The senior has been on a tear since NCAAs last year where she won the 10000-meter title. Seidel then continued her winning ways during the cross country season and picked up both distance crowns indoors (3000, 5000). Over in the red corner stands Arkansas’ Dominique Scott. Also a senior, Scott finished runner-up to Seidel last season at this distance, took third at the DI Cross Country Championships and most recently beat the field to the line at the Stanford Invitational over 5000 meters. While Seidel and Scott are the headliners, don’t forget about Michigan’s Erin Finn, who is competing unattached, or New Mexico’s Alice Wright. Finn took second in both distance races indoors and Wright finished eighth in this same race at NCAAs last year. By the time this race gets underway Sunday night, most of the nation will either be in bed or getting ready for bed. If you can stay up at least 30 minutes longer, you’ll be glad you did. Syracuse’s Colin Bennie, Southern Indiana’s Johnnie Guy, Colorado’s Pierce Murphy, Butler’s Erik Peterson and Northern Arizona’s Futsum Zienasellassie comprise a talented field of collegians, while Bernard Lagat and collegiate record holder Sam Chelanga (27:08.49) hold it down for the professionals. Question: What do you get when you have the top-4 men’s teams and four of the top-6 women’s teams competing in the same meet? Answer: The chance for some major fireworks. That’s going to be the case this weekend in Baton Rouge, where the men’s teams from top-ranked Texas A&M, second-ranked Florida, third-ranked LSU and fourth-ranked Arkansas fight it out, as will the women’s teams from top-ranked Arkansas, second-ranked Kentucky, fifth-ranked Florida and sixth-ranked LSU. If you’re looking for speed and big marks in the field, you can stop your search. One look at the USTFCCCA Event Squad Rankings shows exactly why this relay should be a good one. Top-ranked Arkansas goes up against second-ranked LSU and fifth-ranked Miami (Fla.). Taliyah Brooks (No. 20, 100H), Payton Stumbaugh (No. 2, 100H), Alex Gochenour (No. 14, 100H) and Kelsey Herman comprise the Razorbacks’ team, while Mikiah Brisco (No. 21, 100H), Daeshon Gordon (No. 8, 100H), Chanice Chase (No. 12, 100H) and Danielle Phillips form the Tigers’ and Jamika Glades, Stefani Kerrison, Ebony Morrison (No. 9, 100H) and Lateisha Philson make up the Hurricanes’ foursome. With Oregon’s top-ranked team at the Penn Relays, the rest of the five best squads in the nation are in action at LSU. Second-ranked Florida (42.85) faces third-ranked Kentucky (43.14), the fourth-ranked Tigers (43.23) and fifth-ranked Texas A&M (43.29). Don’t forget about Alabama or Arkansas, either. There’s fast and then there’s fast. We’re going to find out the difference on Saturday. LSU, the nation’s fastest team (38.94 seconds) led by Nethaneel Mitchell-Blake, goes up against Texas A&M, the second fastest (39.02). Arkansas, with Jarrion Lawson and Marqueze Washington, could also pull out a surprise victory. Alabama’s Quanesha Burks and Kentucky’s Sha’Keela Saunders must know each other’s tendencies by now. They’ve seen each other a lot over the past two years. Other than being in the same conference (SEC), Burks and Saunders met up at the past two NCAA championships. Burks won both the indoor and outdoor title, while Saunders finished second and third, respectively. Burks currently leads the nation with a leap of 6.76 meters (22-2¼), while Saunders sits in a tie for seventh (6.51m/21-4¼). This year there have been three 15-foot vaulters in the women’s ranks — Arkansas’ Lexi Weeks, Duke’s Megan Clark and Miami (Fla.)’s Alysha Newman. On Saturday, two of them will face each other: Weeks and Newman. Weeks, who won the indoor title, has the best vault of the season at 4.64 meters (15-2¾). Newman has the third best mark of the season (4.60m/15-1) behind Weeks and Clark. Two-time NCAA champ Shamier Little of Texas A&M is the star of the field, but don’t count out Kentucky’s Kiah Seymour, LSU’s Chanice Chase or Kymber Payne. In fact, Seymour and Chase have posted a better time than Little this season. Seymour is the best of the bunch at 56.10 (fifth nationally), while Chase is two spots behind at 56.17. Little clocked a 56.38 (ninth nationally) at the UCLA vs. Texas A&M Dual Meet earlier this month and Payne holds down 12th at 56.60.